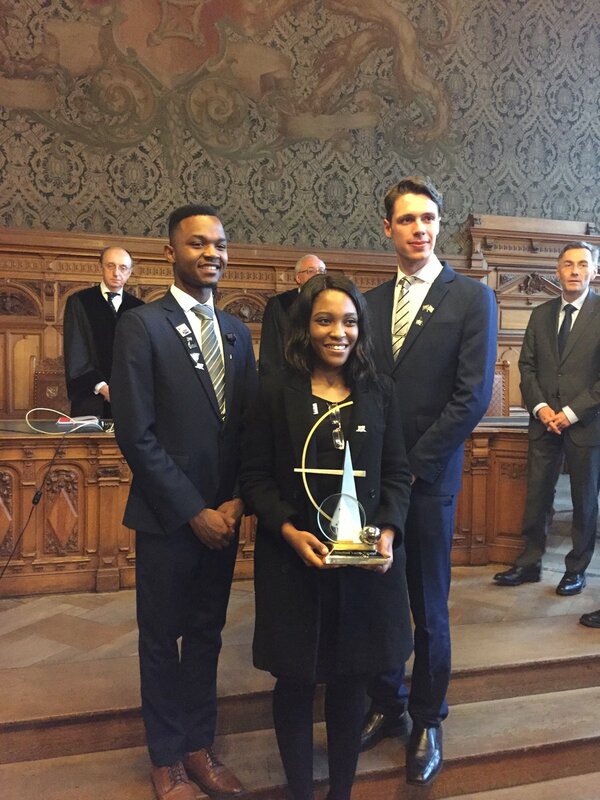 For the first time in its 26-year history, an African team – made up of students from the University of Pretoria – has won the International Manfred Lachs Space Law Moot Court Competition. The team, consisting of students Simon Motsweni and Simon Botha, under the guidance of coaches Ruvimbo Samanga and Lawrence-John Maralack, walked away with the Lee Love Winners Award at the world finals, held in Bremen, Germany, on 4 October. Simon Botha also won the Sterns and Tennen Award for Best Oralist. The world finals coincided with the International Astronautical Congress (IAC) – the world’s largest convention for the space industry, which also took place in Bremen. The finals were judged by the prestigious judges of the International Court of Justice (ICJ), who faced the important task of determining which team had come up with the best legal solutions and arguments on a hypothetical space law dispute concerning questions related to ‘conflicting activities in outer space, planetary protection, and outer space security’. For more detail about the problem debated please click here. The International Manfred Lachs Space Law Moot Court Competition is an international Space Law capacity building programme organised for the past 26 years by the International Institute of Space Law (IISL), with four regions participating: Africa, Asia-Pacific, Europe, and North America. Africa joined the competition in 2011, and is supported by the dti and the South African Council for Space Affairs (SACSA), including institutions such as South African National Space Agency (SANSA), and the National Space Research and Development Agency (NARSDA) of Nigeria. The competition brings together the four winning teams from each major region. Earlier in the year the UP team beat Uganda’s Makerere University team to become the African champions in a regional round that saw universities from South Africa and Nigeria also competing for the prestigious regional title. The first Manfred Lachs Moot Court Competition was held in 1992, when the Association of US Members of the IISL (AUSMIISL) invited Georgetown University, George Washington University and the American University to each send two teams to participate in a moot court competition during the first World Space Congress held in Washington, DC, in 1992. In 1993, the European Regional Round was created and, after the death of Judge Manfred Lachs, the competition was renamed in his honour and memory. In 2000, the Asia-Pacific Regional Round was created and in 2011, the African Round. Participation in the Competition has steadily increased over the years, with a large number of teams from leading law schools now participating in each of the regions. Currently, around 60 teams register each year to participate in the Manfred Lachs Space Law Moot Court Competition, and numbers continue to grow. The IISL is looking at expanding the competition to Latin and South America in the future.